The no-fly zone... A 186 mph double-deck TGV to Nice, boarding at Paris Gare de Lyon. It's the civilised alternative to flying. Take Eurostar from London to Lille or Paris, then a 186 mph TGV Train à Grande Vitesse through the French countryside with a glass of red wine in hand from Lille or Paris to Avignon, Marseille, Nice, Nîmes, Montpellier, Perpignan, Lyon, Bordeaux, Toulouse, Rennes or Nantes... It's comfortable & affordable: London to to Lyon or Bordeaux from £62 one-way or £110 return, London to Nice, Marseille or Perpignan from £68 one-way or £120 return. That's city centre to city centre, no baggage fees, no airport taxes, significantly less impact on the environment and infants go free. Bring your own bottle of wine if you like, no rules against that on the rails! ...for train times & fares from London, and how to buy tickets. 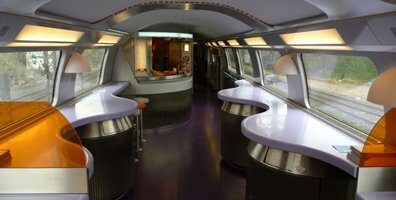 What are French TGV trains like? 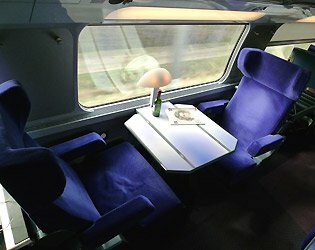 What are French overnight trains like? SNCF (Société Nationale des Chemins de Fer), www.oui.sncf (formerly www.voyages-sncf.com). To check train times & fares & book trains within France see www.loco2.com or www.trainline.eu (residents of any country). To check for disruption affecting trains in France (in French), see www.sncf.com/fr/horaires-info-trafic. Eurostar trains from London to Paris: www.eurostar.com. Corsican Railways. Nice-Digne railway. Petit Train Jaune. www.ratp.fr. For a Paris metro map, select 'plans'. 18 April 2019. Train times valid 9 Dec 2018 to 14 Dec 2019. You can buy tickets direct from Eurostar at www.eurostar.com. You print out your own ticket. Eurostar bookings open 120 days ahead, or at certain periods up to 180 days ahead. You print your own ticket or collect it at the station. For journeys beyond Paris, it can be better to book at www.loco2.com, see the section relevant to your final destination for advice. A Eurostar at St Pancras in London. See guide to travel by Eurostar. See tips for choosing your seat. 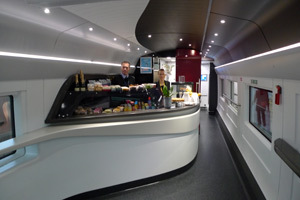 The cafe-bar: Each Eurostar has two café-bars serving drinks & snacks including a range of wraps & sandwiches plus hot dishes such as Chicken Tikka Massala. Eurostar is the high-speed passenger train from London St Pancras to Paris Gare du Nord via the Channel Tunnel, taking just 2 hours 15 minutes at up to 300km/h (186 mph). Typically, 95% of Eurostar trains run on time or within 15 minutes, against just 63%-69% of flights on the same routes, and it's not surprising that Eurostar has now captured over 70% of the London-Paris market from the airlines. For more information including the 3 classes on board, check-in procedures, luggage arrangements, food & drink, & tips for choosing the best seats, see the London to Paris by Eurostar page. Eurostar fares work like airline fares, so book in advance for the cheapest seats. Fares start at £44 one-way or £58 return 2nd class, £112 one-way or £169 return 1st class (limited availability, no refunds, no changes to travel plans). Some Eurostars stop at Ebbsfleet & Ashford in Kent, many call at Lille in Northern France, a few call at Calais Fréthun station a few kilometres outside Calais. You can book online at www.eurostar.com with print-at-home tickets, or you can collect them from the e-ticket machines at the station. You can book by phone, calling Eurostar on 03432 186 186 (+44 1233 617575 from outside the UK). Eurostar bookings open 120 days before departure, or at certain periods up to 180 days ahead. 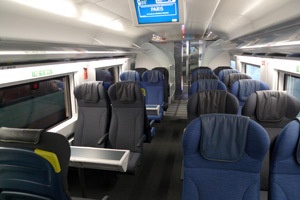 Tips on choosing a specific Eurostar seat. For cheap breaks from the UK to Paris combining Eurostar with a hotel, check the following companies. A short break can be cheaper than booking Eurostar and a hotel separately - and in some cases if you need to travel at short notice, cheaper than a regular Eurostar ticket, if the cheaper fares have sold out. French Travel Service, www.f-t-s.co.uk, 0844 84 888 43 (pls quote 'seat61' when you book). It's still possible to travel from London to Paris by train & ferry if you want, although it takes 9 hours and you now have to buy separate train and ferry tickets. It also costs more than a cheap return ticket on Eurostar. But you get to sail across the English Channel from the White Cliffs of Dover, you avoid going through the Channel Tunnel if that's an issue for you, and if you have to travel at very short notice it can sometimes be cheaper. For more information see the London to Paris by train & ferry page. You can buy through tickets to Paris from over 100 major British cities & larger towns using www.eurostar.com. Just type the station name into the journey planner and see if it is recognised. Edinburgh, Glasgow, Leeds, York, Manchester, Liverpool, Birmingham, Bristol, Cardiff are all recognised, as are larger towns such as Reading, Basingstoke, High Wycombe or Milton Keynes, although smaller towns & villages aren't included. A Eurostar through ticket is usually much cheaper than buying a separate train ticket to London. You must use the United Kingdom version of www.eurostar.com so that payment is taken in pounds - even if you live in France and want a Paris to York ticket! See more information about Eurostar through tickets & how they work here. Alternatively, even if your local station isn't one of Eurostar's select 100+ stations, you can usually buy a separate ticket to a special destination called London International CIV, designed for use with Eurostar tickets. These exist from most stations in Britain, they include the Underground fare across London to St Pancras if needed, they generally have few or no time restrictions (so an off-peak price applies even in the peak), and you're covered by the international CIV conditions of carriage so if there's a delay to the UK train and you miss your Eurostar, you are entitled to be re-booked on a later one, no problem. For more details and to check prices & buy tickets from your local station to London International, see the How to buy connecting UK train tickets page. At www.loco2.com you can book from ANY British station to Paris or anywhere in France as one transaction. It simply adds a ticket from your chosen British station to London International CIV (as described above) to an onward Eurostar + French train ticket. By ferry+train: If you live in the West Country or along the south coast, consider a ferry crossing from Plymouth, Poole, Southampton, Portsmouth or Newhaven to France, then a train onwards to Paris. First check ferry routes, times and fares at the Seat61 Ferry shop (all routes & operators), or at www.brittany-ferries.co.uk, www.ldlines.co.uk or www.condorferries.co.uk. Then check UK train times from your local station to the UK port using www.nationalrail.co.uk. 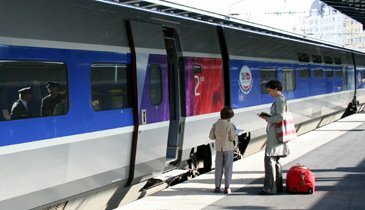 Finally, check train times & fares from the French port to Paris and book online at www.loco2.com. Allow at least an hour, preferably 90 minutes, between train and ferry on both sides of the Channel. By Night Riviera sleeper + Eurostar: From Devon or Cornwall, you can also use the overnight Night Riviera sleeper train to London then a morning Eurostar to Paris, for details see here. By daytime trains... You can buy through tickets from Glasgow or Edinburgh to Paris by daytime inter-city train & Eurostar at the Eurostar website. This occasionally (wrongly) comes up with 'no trains available', but you can always buy a separate ticket from Scotland to London International CIV as explained here. By Caledonian Sleeper + Eurostar: A time-effective way to avoid flying is to hop on the overnight Caledonian Sleeper from Inverness, Aviemore, Aberdeen, Perth, Dundee, Fort William, Glasgow, Edinburgh to London, then take a morning Eurostar to Paris. See the Caledonian Sleeper page for details. Belfast or Dublin to Paris using Eurostar, via London: You can buy a cheap SailRail train+ferry ticket from Belfast to London for £53, or Dublin to London for €50 each way, see the Northern Ireland page or Ireland page for timetables, fares & full details. Then book Eurostar separately at www.eurostar.com, from £45 one-way or £58 return. Allow plenty of time to cross London, including time for the Eurostar check-in and any delay to your train from Scotland or Holyhead to London. When connecting with a non-changeable, non-refundable Eurostar, bear in mind that the all-weather cruise ferries are very reliable, but the fast ferries can be cancelled in bad weather. Belfast or Dublin to Paris using the Rosslare-France or Cork-France ferries, avoiding London: Travel by train from Belfast to Dublin then Dublin to Rosslare or Cork (see www.irishrail.ie), then sail either by Irish Ferries cruise ferry from Rosslare to Roscoff or Cherbourg in France (see www.irishferries.com) or by Brittany ferries (www.brittany-ferries.co.uk) from Cork to Roscoff or Cherbourg for a train to Paris (see www.loco2.com). To plan this, start by checking ferry sailing dates & times at www.irishferries.com or www.brittany-ferries.co.uk. Then work out the best connection from Dublin to Rosslare or Cork using www.irishrail.ie, then the connection from Belfast also at www.irishrail.ie. A Eurostar runs direct from London to Disneyland Paris on Mondays, Wednesdays, Fridays & Sundays (runs on additional dates in school holidays). It leaves London St Pancras at 10:14, calling at Ebbsfleet 10:34, Ashford at 10:58 and arriving Marne la Vallée-Chessy, the station right next to Disneyland Paris, at 14:03. The entrance to the Disneyland Park, Disney Studios and Planet Hollywood is just outside the station to the right. Check days of running and book online at www.eurostar.com. Returning, the Eurostar leaves Marne la Vallée-Chessy (Disneyland) on Fridays & Sundays at 16:55, arriving Ashford 18:06, Ebbsfleet 18:27 and London St Pancras at 18:47. It also runs on Mondays & Wednesdays at 18:01 arriving Ashford 19:04, Ebbsfleet 19:26 and London 19:46. Remember to allow for the 30 minute Eurostar check-in, at the top floor level of Marne la Vallée-Chessy station. See www.disneylandparis.com to book holidays and short breaks to Disneyland Paris, including the Eurostar, hotel accommodation and entrance to the Disneyland park or buy Eurostar tickets separately at www.eurostar.com. If the direct Eurostar is fully-booked or too expensive, don't worry. 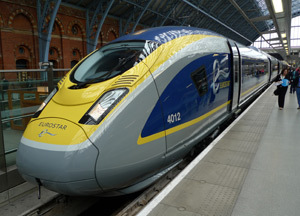 You can book a regular London-Paris Eurostar at www.eurostar.com then simply use the RER (express metro) every 15 minutes between Paris Nord and Marne-la-Vallée-Chessy (Disneyland), changing at Chatelet les Halles or Gare de Lyon, journey time about 58 minutes, fare a few euros, OR you can try www.loco2.com to book a journey from London to Marne la Vallée by Eurostar and French TGV train with one easy change at Lille. The famous Chateau at Versailles (www.chateauversailles.fr) is 30-40 minutes southwest of central Paris using a frequent express metro train on RER line C to Versailles-Rive Gauche station. Versailles-Rive Gauche is 5 minutes' walk from the entrance to the Chateau. Just buy a Eurostar ticket to Paris at www.eurostar.com then buy an RER ticket from central Paris (zone 1) to Versailles (zone 4) when you get there, the fare is just over €4 each way. RER line C runs directly to Versailles Chateau - Rive Gauche from various RER/metro stations in central Paris, including the Gare d'Austerlitz, St Michel-Notre Dame, Musée d'Orsay, Invalides, & Champ de Mars-Tour Eiffel. From the Gare du Nord, take RER line B two stops to St Michel-Notre Dame, then change onto RER line C to Versailles-Rive Gauche. See www.ratp.fr for a plan of the RER & metro network You can check RER C times on this route at www.transilien.com. Travel tip: A nicer way to reach Versailles from central Paris to to go to the Gare St Lazare and take Transilien line L to Versailles-Rive Droite. These Transilien suburban trains run every 15 minutes, taking about the same time as the RER C route, but unlike RER C almost all the journey is above ground with views of wealthy Parisian suburbs, a Seine crossing, and the towers of the financial district at La Défense. You arrive at Versailles-Rive Droite which is a slightly longer walk from the chateau, but you walk through the old part of town and can enter the chateau through its gardens at the 'Bassin de Neptune' rather than through the car park as with the walk from Versailles-Rive Gauche. See www.transilien.com. Lunch at the Train Bleu restaurant, then stroll to your TGV. There's no check-in to worry about. Chill... Bring your own picnic & wine or visit the café-bar. You arrive in the centre of Nice. It's easy to travel from London or anywhere in the UK to Cannes, Nice or Monte Carlo by Eurostar and high-speed TGV, a chance to chill out with a good book and a glass of wine, and maybe even have lunch in Paris on the way. It's affordable, too, with cheap fares if you book in advance, centre to centre with no hidden fees. 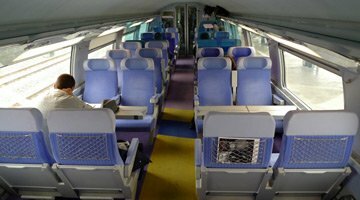 Unfortunately, the Paris-Nice sleeper train was discontinued in December 2017. Option 1, via Lille: By Eurostar to Lille Europe, a simple same-station change, then TGV from Lille to Marseille and an onward train to Nice. This is the easiest option if you've lots of baggage, kids or mobility problems, as there's no need to cross Paris. Option 2, via Paris: By Eurostar to Paris Gare du Nord, then impressive double-decker TGV Duplex from Paris Gare de Lyon to Nice. This is the fastest option, with a wider choice of departures & often cheaper fares than going via Lille. How about lunch in Paris at the fabulous Train Bleu restaurant? Option 3, using the lo-cost Ouigo trains: By Eurostar to Paris Gare du Nord, then by France's lo-cost high-speed budget-airline-on-rails from Paris Gare de Lyon to Nice. Ouigo fares from Paris to Nice start at just €19, but it's a no-frills train. What's the train ride to Nice like? The Man in Seat 61 says: "Attending a conference on the Côte d'Azur, I travelled from London to Nice by train. A morning Eurostar to Paris, lunch at the Train Bleu restaurant at the Gare de Lyon, then an afternoon TGV Duplex to the South of France, with a 1st class Club Duo seat on the upper deck. Wonderful! I put my feet up & relaxed, watched the French villages of the Rhone Valley pass by, caught up on my reading & emails and watched a movie on my iPhone. To anyone who has only known the stresses of airports, flights & motorways, chilling out on a high-speed train is a revelation..."
For more photos of the train ride from Paris or Lille to Nice, see the Paris to Nice by train page. Photo courtesy of Mike Sloan. This is the easiest option as there's no need to cross Paris, just one easy same-station interchange at Lille & Lyon. Take a Eurostar from London St Pancras to Lille Europe and change onto a direct TGV to Lyon Part Dieu by-passing Paris, and change onto another TGV from Lyon to Toulon, St Raphael, Cannes, Antibes or Nice. Ideal if you've luggage, kids or mobility problems. But for a wider choice of departures and in many cases cheaper fares, also check out journeys via Paris in option 2 below. Tips for changing trains at Lille. Incidentally, the direct Lille-Nice TGV was discontinued in December 2018, hence the change in Lyon. How to read these timetables: It's easy, you read downwards, each column is a journey you can take. You change trains at the grey bar. How to reach St Tropez, Monte Carlo, Juan les Pins, Menton No Eurostars run on 25 December. Always check train times for your specific dates using www.loco2.com or www.trainline.eu, as the times here don't take account of day-to-day changes in timetable. Don't book any Eurostar tickets until you have confirmed onward train times. Eurostar offer combined Eurostar+TGV fares from London to Nice, Cannes, Antibes or Toulon, starting at £68 one-way or £120 return 2nd class, £134 one-way or £238 return 1st class via either Paris or Lille. Like air fares, fares increase as the cheaper seats are sold, so book early & shop around for the cheapest departure. Check the online booking system to see prices for your date of travel. Children under 4 go free. Children 4 but under 12 £63 one-way, £111 return. Youth fares (aged 12-25) start at £65 one-way, £114 return. The direct Lille-Nice TGV is usually single-deck TGV with a Christian Lacroix designer interior as shown below, but you may find this train consists of two TGV units, one of which is a TGV Duplex double-decker. You can tell which sort of TGV you are booking if you use www.loco2.com or www.trainline.eu as both sites will give you the option of an upstairs or downstairs seat if it's a Duplex. If you don't get that choice, it's a single-decker. This is the fastest, cheapest & most frequent option, if you don't mind changing trains & stations in Paris. Take Eurostar from London St Pancras to Paris Gare du Nord in just 2h16, change stations in Paris by metro or taxi as explained here, then take a 186mph double-decker TGV Duplex from Paris Gare de Lyon to Nice in 5h37. Although a same-station change in Lille is easier, you'll find a wider range of departures via Paris, and usually cheaper fares available. Why not take an earlier Eurostar and have lunch at the fabulous Train Bleu restaurant inside the Gare de Lyon before chilling out on an afternoon TGV Duplex to the Sunny South of France? For an account of the journey in pictures, see the Paris to Nice by train page. * = The 05:40 Eurostar from London usually doesn't run in July & August. Fri = This TGV runs on Fridays only. 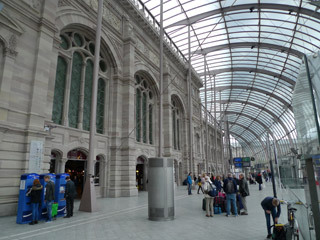 f = arrives/departs at Lille Flandres station, 450m 6-minute walk from Lille Europe Eurostar/TGV station. By all means choose an earlier evening Eurostar outward or a later morning one inwards. Or a later morning TGV going south, or an earlier evening TGV going north. Your call! There are combined Eurostar+TGV fares from London to Nice, Cannes, Antibes or Toulon, starting at £68 one-way or £120 return 2nd class, £134 one-way or £238 return 1st class via either Paris or Lille. Like air fares, fares increase as the cheaper seats are sold, so check the online booking system to see prices for your date of travel. Book early & shop around for the cheapest departure. Alternatively, you can buy separate Eurostar & TGV tickets. London to Paris by Eurostar starts at £45 one-way, €69 return. Paris to Nice, Cannes, Antibes or Toulon starts at just €25 each way. 2nd class seats on upper deck with a mix of tables for 4 & unidirectional seating. 360º photo. 1st class upper deck seats, club duo on the left, club quatre on the right. 360º photo. A TGV Duplex at Nice Ville station in the older blue and grey colour scheme. An impressive station, complete with palm trees! In 2013, French Railways launched a budget-airline-on-rails called Ouigo, www.ouigo.com. 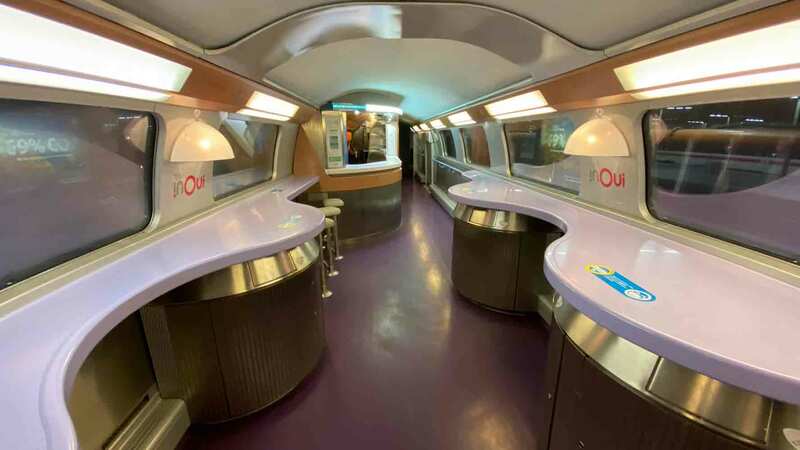 Ouigo operates two no-frills trains a day from Paris to Cannes & Nice using special double-deck TGV Duplex trains with just one class of seating, no catering and no 1st class. Like budget airlines, they've added a 30-minute check-in, there are baggage limits and extra fees for large or additional bags. For more information about Ouigo including ticketing buying tips, travel tips, photos & the Man in Seat 61's opinion of Ouigo, see the Ouigo page. There's no reason why you can't use a Eurostar ticket from London to Paris then a cheap Ouigo ticket from Paris to Cannes or Nice, as long as you allow plenty of time between trains in Paris, meaning 2-3 hours not the usual hour you'd allow with regular trains. That's because Ouigo is a separate company, even though it is wholly-owned by SNCF French Railways. You will be using separate tickets for the Eurostar and for Ouigo, Ouigo has no agreement in place with Eurostar to guarantee onward travel if there's a delay and missed connection. So if one train runs late and you miss the connection. you'll find yourself paying for a new ticket. It's your risk, which means you should allow 2 or 3 hours between trains in Paris, not one. Step 1, travel from London to Paris by Eurostar, leaving London St Pancras at 11:31 and arriving Paris Gare du Nord at 14:47, or any earlier departure. Transfer from Paris Gare du Nord to Paris Gare de Lyon by RER express metro as explained here. Step 2, travel from Paris to Nice by Ouigo high-speed train, leaving Paris Gare de Lyon at 17:15 and arriving Cannes at 22:33 or Nice at 23:04. Remember there's a 30 minute check-in for Ouigo in Hall 3, one level down from platform level. There's no catering on Ouigo, so bring food & drink with you. Alternatively, you can take any evening Eurostar you like to Paris, stay overnight, then take the morning 07:19 Ouigo from Paris to Cannes & Nice. Step 1, travel from Nice to Paris by Ouigo high-speed train, leaving Nice at 05:57 or Cannes at 06:26, arriving Paris Gare de Lyon at 11:45. Remember there's a 30 minute check-in for Ouigo in Hall 3, one level down from platform level. There's no catering on Ouigo, so bring food & drink with you. Transfer from Paris Gare de Lyon to Paris Gare du Nord by RER express metro as explained here. Step 2, travel from Paris to London by Eurostar, leaving Paris Gare du Nord at 15:13 arriving London St Pancras at 16:39, or any later departure. Alternatively, you can leave Nice on the later Ouigo at 13:57 or Cannes at 14:26 arriving Paris Gare de Lyon at 19:43. Stay overnight in Paris, then take any morning Eurostar you like back to London. Paris to Cannes or Nice by Ouigo starts at just €19 each way. Plus €5 baggage fee for larger bags, see the Ouigo page for full details. Step 1, go to www.eurostar.com and book a Eurostar from London to Paris. Step 2, go to www.ouigo.com and book Ouigo from Paris to Cannes or Nice. Don't forget you may need to add the €5 extra baggage fee for oversize or additional bags. Only European & United States payment cards are accepted, see the Ouigo page for more information about Ouigo tickets. For St Tropez, travel by train to St Raphael. Buses leave St Raphael bus station (right next to the railway station) for St Tropez every hour or two, journey time 90 minutes, fare just €3. See www.varlib.fr for bus times - click Horaires then look for bus 7601. You will need to buy a ticket on the bus. Be warned that traffic into St Tropez in high summer can be a nightmare, with major delays. There's also a ferry twice a day from April to November, see www.bateauxsaintraphael.com - much more expensive than the bus but a good way to make an excursion that avoids all the summer traffic. These all have railway stations on the Cannes-Nice-Monaco main line, served by hourly local trains, but long-distance trains don't stop there. So for Juan les Pins, travel to Antibes and switch to a local train there, journey time 5 minutes. For Villefranche and Beaulieu, travel to Nice and change to a local train there. Frequent local trains link Nice with Monte Carlo, Menton and Ventimiglia on the Italian border, roughly every half hour. Nice to Monte Carlo takes 21 minutes, Nice to Ventimiglia takes 48 minutes. It's easy to buy train tickets from anywhere in Britain to anywhere in France, here I'll explain the best options. Booking online saves paying phone booking fees, and I recommend using www.loco2.com. But don't forget there are other ways to book online too. You can also book by phone or in person, or get a train travel specialist to arrange a tailor-made trip. 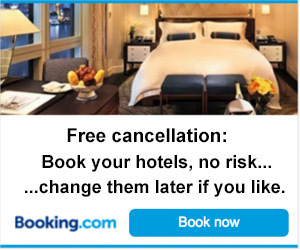 (1) www.booking.com allows you to book your accommodation before train bookings open, with free cancellation. Click here for suggested hotels in Paris. Use www.loco2.com. You can buy one-way or return tickets, in either direction, in €, £ or $. Infants under 4 go free with no ticket necessary, children under 12 can travel at the child rate. International credit cards accepted... 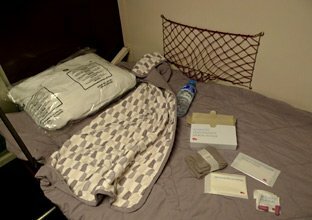 Anyone from any country can use www.loco2.com, as all credit cards are accepted and you'll usually get a print-at-home or a collect-at-station ticket. Booking usually opens 92 days ahead. Eurostar usually opens 120 days ahead and at certain periods up to 180 days ahead, but I strongly recommend waiting until your onward French trains open for booking, so that times & prices can be confirmed before you buy a non-refundable non-changeable Eurostar ticket. Just so you know, the big annual timetable change happens on the 2nd Sunday in December, and most years, bookings for dates after this up to and including the Christmas & New Year period open around mid-October, significantly less than 92 days ahead. On the other hand, in recent years French Railways have opened bookings further ahead than the usual 92 days over the summer months, so by all means try a booking and see if trains appear. You can book from any station in Britain... www.loco2.com allows you to book to or from any British station (even Little Kimble), not just from London. It usually does this by adding a ticket from your local station to London International CIV (if one is available), which gives you travel to London St Pancras (including the Underground if you need it) and the protection of the CIV international conditions of carriage so if your UK train is delayed and you miss your Eurostar, you are entitled to travel on a later one even if you have a non-changeable ticket. In many cases these fares have fewer or no peak-hour restrictions, too, so they allow Monday-Friday peak-time travel at off-peak prices. More explanation (and the ability to buy a ticket to London International CIV separately if you need to) here. Little Kimble to Juan les Pins? No problem! You can book to any station in France. 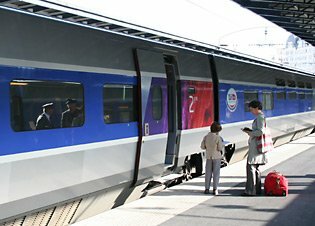 This system can sell tickets to or from any French station on any French train, including TGVs, Intercités, overnight couchette trains or TER local trains, although it cannot sell the special iDTGV trains which run once or twice a day on a handful of routes. Fares vary like air fares, so book as far ahead as you can: Fares for Eurostar & French long-distance trains are cheaper in advance, more expensive closer to the date of travel, so book as early as you can and search for the cheapest departures. Remember that the cheapest tickets mean no refunds, no changes. Tip: Want to go via Lille to avoid crossing Paris? A same-station change in Lille is much easier than crossing Paris, although you'll usually find a wider choice of departures and often cheaper prices via Paris. To filter out the many options via Paris leaving just the ones via Lille, simply click '+ Add via/stopover' and enter 'Lille Europe'. If you don't see any journeys, try adjusting the departure time. For some destinations such as Orleans or Clermont Ferrand there are no direct services from Lille so you'll really have to go via Paris. 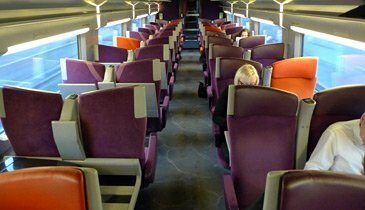 Tip: Choose an upper deck seat on a TGV Duplex: I recommend an upstairs seat for the best views if you use a double-decker TGV Duplex in France. These now operate almost all services from Paris to Lyon, Avignon, Marseille, Nice, and some services from Lille to the South, too. Unlike some sites, www.loco2.com allows you to choose upper or lower deck. Seat numbers 11-58 = lower deck. 61-128 = upper deck. 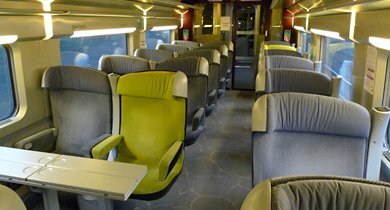 Tip: Upgrade to 1st class on French trains often for very little extra cost! Most booking sites won't let you mix & match 2nd class on Eurostar (on which 1st class is expensive) with 1st class on your onward French train, on which 1st class can cost little more than 2nd class and can even be cheaper, because of the way the pricing quotas work. With Loco2 there's an easy solution: Before running the enquiry, click '+ Add via/stopover', enter Paris Nord (or Lille), select 'specific duration' & enter (say) 1 hour. In the search results, instead of showing a total price for London to your French destination, it will allow you to select a class & price from London to Paris (or Lille) and a separate class & price from Paris (or Lille) to your final destination. See if there's a cheap 1st class fare for your onward French train! Tip: Don't be afraid to split the booking in Paris! For complete control, first book from your local station to Paris (or Lille), add to basket, then book from Paris to your final destination remembering to allow at least 60 minutes to cross Paris trains southbound, 90 minutes including Eurostar check-in northbound. Add to basket and checkout. You can easily adjust the Paris time this way, to stop off in Paris or perhaps have lunch at the Gare de Lyon. SNCF's database now has some sub-standard 40-minute cross-Paris connections when I'd recommend at least 60 minutes, so this is the way to avoid those, too (Loco2 cannot edit these sub-standard connections out, but have thoughtfully added a warning when a sub-60-minute cross-Paris connection comes up). Tip: Children under 4 go free, but what if you want them to have their own seat? Babies & infants go free on all European trains (see age limits here) and don't need a ticket, you just bring them along, but they don't get their own seat. If you want them to have their own reserved seat on a French long-distance train, you can pay a fixed fee called Forfait Bambin. This can't yet be booked on Loco2, so you'll need to book from your local station to Paris or Lille using www.loco2.com, then book your onward French train separately using www.trainline.eu. There's more explanation about Forfait Bambin on the train travel with children page. 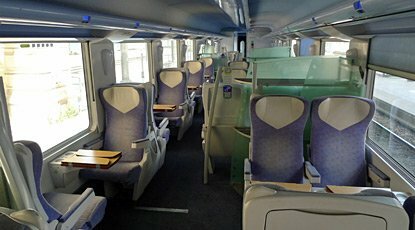 Tip: If you want sole or dual occupancy of a couchette compartment on a French overnight train: On French overnight trains you can book sole or dual occupancy of a 4-berth couchette compartment, this facility is called Espace Privatif, see details of the cost & how to buy tickets here. However, Espace Privatif can't be booked online at Loco2, you need to use www.trainline.eu instead. 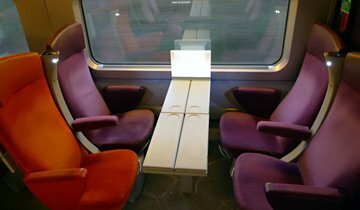 Train seat numbering plans: These plans may help: TGV seat numbering plans. Couchette numbering plans. Who powers Loco2? 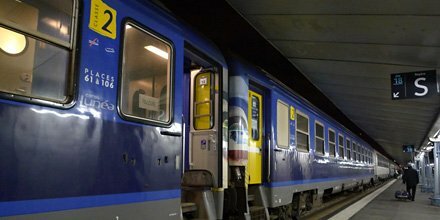 www.loco2.com connects to SNCF's Sabre & Resarail system for prices in euros. Prices should be the same as you'll find on French Railways' own site en.oui.sncf. Option 2, book with Eurostar: www.eurostar.com sells tickets from London to around 70 major French towns & cities, so more limited than Loco2 and it can't book overnight couchette trains, but it can be worth checking prices at www.eurostar.com. It has one potential advantage, after payment you can choose your specific seat on Eurostar (although not on any onward French trains). It issues print-at-home tickets and accepts all credit cards so can be used by anyone from any country. Option 3, split the booking, using Eurostar.com then Trainline.eu: For complete control and the maximum choice of seating options, I myself often split the booking. 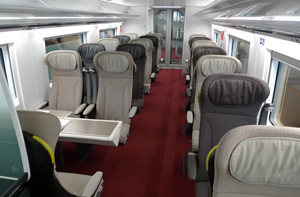 You can book from London to Paris (or Lille) at www.eurostar.com with an opportunity to choose your seat on Eurostar, then book the onward French train at www.trainline.eu with a full range of seating options including the ability to select upper or lower deck on a TGV Duplex or a table for two in 1st class, and on some TGV routes a forward-facing seat. Both sites issue print-at-home or collect-at-station tickets and accept all credit cards so work fine for anyone from any country. Splitting the booking in this way allows you to adjust your cross-Paris transfer time so that you have at least 60 minutes between trains and/or can have time for lunch in Paris. It also allows you to mix and match 2nd class on Eurostar (as 1st class is expensive) with a cheap 1st class deal on the French train, as this sometimes costs only a little more than 2nd class, and in some circumstances can actually be cheaper. Unlike some other sites, Trainline.eu can sell iDTGV tickets, and can sell Forfait Bambin tickets if you have an infant or baby and want them to have their own seat on a French train, you can see how Trainline's features compare with other websites for booking French trains in this comparison table. Option 4, buy from Rail Europe in the United States, Canada, Australia, Asia, Africa or South America: If you live outside Europe you can book with www.raileurope.com (USA), www.raileurope.ca (Canada) or www.raileurope-world.com (Australia, NZ, Asia, Africa, South America). All these sites charge a booking fee, and at the time I write this, none give seating options. I'd also recommend a price comparison with the other sites mentioned above, as I have known www.raileurope.com suppress the cheapest fares for the US market, meaning you could make significant savings using www.loco2.com or www.trainline.eu instead. In addition, see this table comparing the features of the various sites selling French train tickets. You can buy tickets by phone, although a booking fee is charged. In the UK, try International Rail on 0844 248 248 3, lines open 09:00-17:00 Mondays-Fridays. Rather than book trains & hotels yourself independently, you can get an expert company such as Railbookers to arrange your whole trip to your own specification. Hotels, train tickets and transfers can all be sorted as one booking in one phone call. As you're then booking a package, they'll look after you if anything happens such as a strike or major delay. Railbookers now operate in the UK, USA & Australia. Just tell them when and where you want to go, and they'll create the best rail holiday or tour for you. If you'd prefer to go to France on an escorted tour with a convivial group of travellers rather than travelling solo, here are the two UK companies which arrange escorted tours by train from the UK to destinations all over Europe on various dates through the year. Both companies are part of the same group. Relax by train to Provence: A TGV is the stress-free way from the UK to Provence... What are TGV trains like? 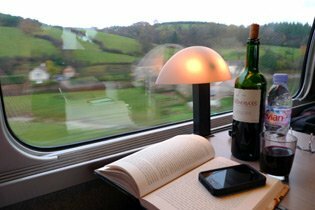 It's easy to travel from London or anywhere in the UK to Avignon, Aix or Marseille by Eurostar & high-speed TGV, a chance to chill out with a good book & a glass of wine, and maybe even have lunch in Paris on the way. With cheap fares if you book in advance, it's affordable too. Option 1, by direct Eurostar: Eurostar run a direct train from London to Avignon & Marseille up to 4 times a week in summer, no service in winter, leaving just after 7am. See the Direct Eurostar to Lyon, Avignon & Marseille page for details. Option 2, via Lille: By Eurostar to Lille Europe, where you make a simple same-station change onto a direct TGV to Avignon, Aix or Marseille. No need to cross Paris, so ideal if you've baggage, kids or mobility problems. Option 3, via Paris: By Eurostar to Paris Gare du Nord, then an impressive double-deck TGV Duplex from Paris Gare de Lyon to Avignon, Aix or Marseille. There's a wider choice of departures and often cheaper fares this way. How about lunch in Paris at the fabulous Train Bleu restaurant inside the Gare de Lyon? Or travel time-effectively with an evening Eurostar to Paris in 2h20, an overnight hotel then a morning TGV to the south in 2 or 3 hours? Eurostar run a direct train from London to Lyon, Avignon & Marseille up to 5 times a week in summer, no service in winter, leaving London around 07:19. If the early departure and days of running suit you, it's the easiest ooption. For dates of running, timetable and full details, see the Direct Eurostar to Lyon, Avignon & Marseille page. If the direct Eurostar isn't running or doesn't suit you, this is the easiest option. Take a Eurostar from London to Lille, make one simple same-station change of train at Lille onto a direct TGV to Provence, by-passing Paris. Ideal if you've luggage, kids or mobility problems. But for a wider choice of departures and in many cases cheaper fares, also check out journeys via Paris in option 2 below. * On the 14:03 TGV from Lille, you need to change trains at Lyon Part Dieu as well. Avignon TGV station is 3 miles from Avignon city centre & Avignon Centre station. A new rail link from Avignon TGV station to Avignon Centre station opened in 2013 and shuttle trains now run every 30-45 minutes, journey time 5 minutes, fare around €1.80. If you'd rather travel to Avignon Centre, simply specify 'Avignon Centre' when booking at www.loco2.com and it'll add the shuttle train for an extra £1.50. Map of Avignon showing stations. Aix en Provence TGV station is 10 miles from Aix city centre. Always check train times for your specific dates... The timetables here are simplified, and don't take account of day to day changes in timetable. Please check train times for your date of travel using www.loco2.com or www.trainline.eu, times may vary on certain dates, and remember that booking only opens 92 days ahead. No Eurostars run on 25 December. There are combined Eurostar+TGV fares from London to Avignon, Aix-en-Provence & Marseille, starting at £68 one-way or £120 return 2nd class, £134 one-way or £238 return 1st class via either Paris or Lille. Alternatively, you can buy separate Eurostar & TGV tickets. London to Paris by Eurostar starts at £45 one-way, £58 return. Paris to Nice, Cannes, Antibes or Toulon starts at just €25 each way. This is the fastest, cheapest & most frequent option, if you don't mind changing trains & stations in Paris. Take Eurostar from London to Paris in just 2h16, change stations in Paris by metro or taxi as explained here, then take a direct 186mph double-decker TGV Duplex from Paris Gare de Lyon to Nice in 5h37. Although a same-station change in Lille is easier, you'll find a wider range of departures via Paris and often cheaper fares available. Why not take an earlier Eurostar and explore Paris for a while, or have lunch at the fabulous Train Bleu restaurant inside the Gare de Lyon before boarding your TGV to the Sunny South of France? * = Times vary, it leaves Paris at 20:37 on Mondays and Fridays arriving Marseille 00:01. ** = The 05:40 Eurostar from London usually doesn't run in July or August. Shaded = Time-effective journey with overnight hotel stop in Paris. By all means choose an earlier evening Eurostar or later morning TGV outward or an earlier evening TGV & later morning Eurostar inwards. Suggested hotels near the Gare du Nord or Gare de Lyon in Paris. Avignon TGV station is 3 miles from Avignon city centre & Avignon Centre station. A new rail link from Avignon TGV station to Avignon Centre station opened in December 2013 and shuttle trains now run every 15-30 minutes, journey time 5 minutes, fare around €1.80. 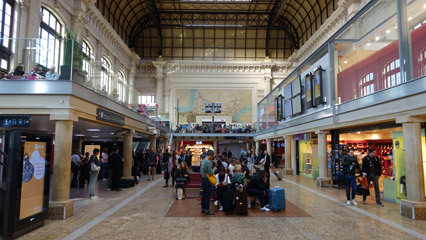 If you'd rather travel to Avignon Centre, simple specify 'Avignon Centre' when booking at www.loco2.com and it'll add the shuttle train for an extra £1.50. Map of Avignon showing stations. Always check train times for your specific dates... The timetables here are simplified, and don't take account of day to day changes in timetable. Please check train times for your date of travel using www.loco2.com or www.trainline.eu, times may vary on certain dates, and remember that booking only opens 92 days ahead. Alternatively, you can buy separate Eurostar & TGV tickets. London to Paris by Eurostar starts at £45 one-way, £58 return. Paris to Avignon, Aix or Marseille starts at just €25 each way. Can't find any cheap tickets? You can also try the budget Ouigo option shown here. In 2013, French Railways launched a budget-airline-on-rails called Ouigo, www.ouigo.com. 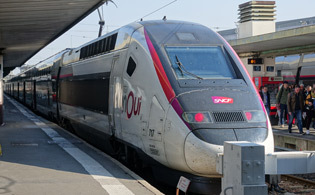 Ouigo operates several no-frills trains a day from Paris to Lyon, Aix en Provence, Avignon, Marseille, Nîmes & Montpellier using special double-deck TGV Duplex trains with just one class of seating, no catering and no 1st class. Like budget airlines, they've added a 30-minute check-in, there are baggage limits and extra fees for large or additional bags. For more information about Ouigo including ticketing buying tips, travel tips & photos, see the Ouigo page. There's no reason why you can't use a Eurostar ticket from London to Paris then a cheap Ouigo ticket from Paris to Lyon, Avignon, Aix or Marseille, as long as you allow plenty of time between trains, meaning several hours not the usual hour to cross Paris you'd allow with regular trains. That's because Ouigo has been set up as a separate company, even though it is wholly-owned by SNCF French Railways. You will be using separate tickets for the Eurostar and for Ouigo, Ouigo has no agreement in place with Eurostar to guarantee onward travel if there's a delay and missed connection. So if one train runs late and you miss the connection. you'll find yourself paying for a new ticket. It's your risk, which means you should allow 2 or 3 hours or more between trains in Paris, not one. Step 1, go to www.eurostar.com and book a Eurostar from London St Pancras to Paris Gare du Nord from £44 one-way, £58 return. 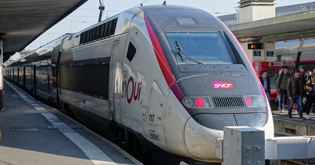 Step 2, go to www.ouigo.com and book a lo-cost Ouigo TGV from Paris to Lyon, Aix en Provence, Avignon, Marseille, Nîmes & Montpellier from as little as €10 each way, but don't forget you may need to add the €5 extra baggage fee for oversize or additional bags. Only European & United States payment cards are accepted, see the Ouigo page for more information about Ouigo tickets. Some Ouigo departures leave from the Gare de Lyon in central Paris, but some go from Marne La Vallée a 45-minute €8 RER ride outside Paris. Obviously, pick one leaving from Gare de Lyon if you can, allowing at least 2 or 3 hours between the Eurostar arrival and Ouigo departure. You can transfer from Paris Nord to Paris Gare de Lyon by RER express metro in about 30 minutes as explained here. If you need to transfer to Marne la Vallée, allow 3-4 hours between Eurostar arrival and Ouigo departure. To reach Marne la Vallée, take take RER line B from Paris Nord to Chatelet-les-Halles, then RER line A to Marne la Vallée-Chessy. Journey time 50 minutes, trains run every 10-15 minutes. Tip: I'd start with the Ouigo booking, then work backwards to find a connecting Eurostar. Do a dry run on both sites before booking for real. Option 1, via Lille: By Eurostar to Lille Europe, a simple same-station change, then TGV from Lille to Nîmes & Montpelier. Change at Montpellier for Carcassonne. Change at Montpellier for Narbonne & Perpignan, although on certain days you'll find a direct TGV from Lille. This is the easiest option especially if you've lots of baggage, kids or mobility problems, as there's no need to cross Paris. Travelling by high-speed train at up to 186mph, you can leave London in the afternoon and arrive in the South of France in the evening! Option 2, via Paris: By Eurostar to Paris Gare du Nord, then impressive double-decker TGV Duplex from Paris Gare de Lyon to Nîmes, Montpelier, Narbonne or Perpignan, change at Narbonne for Carcassonne. This is usually the most frequent, fastest and usually cheapest option, although it involves changing stations in Paris by metro or taxi. But how about lunch in Paris at the fabulous Train Bleu restaurant at the Gare de Lyon between trains? Option 3, via sleeper train from Paris: Runs daily from July to early September, and on Friday & Sunday nights in winter. Take Eurostar to Paris Gare du Nord, then sleep in a couchette from Paris Gare d'Austerlitz to Carcassone, Perpignan or Portbou on the intercité de nuit overnight train. This is the most time-effective option of all! This is the most stress-free way to travel from London to the south of France. Take a Eurostar to Lille and make a simple same-station change of train onto a 186 mph high-speed TGV direct to Nîmes & Montpellier with no need to cross Paris. South of Lyon the TGV runs along the scenic Rhône Valley, crossing and re-crossing the River Rhône, flying at ground level through the hills of Provence over some breathtaking viaducts, passing pretty French villages and the occasional chateau. If you're going beyond Montpellier, watch out for your first sight of the Mediterranean coast and for the flamingos on the various étangs (lakes) which the train passes or crosses on a causeway. m = Change trains at Montpellier. Time may vary. How to buy tickets About changing trains in Lille What is Eurostar like? What are TGVs like? There are many other journey possibilities changing trains and stations in Paris. Always check train times for your date of travel using www.loco2.com as times may vary on specific dates. There are combined Eurostar+TGV fares from London to Nîmes, Montpellier, Agde, Narbonne & Perpignan, starting at £68 one-way or £120 return 2nd class, £134 one-way or £238 return 1st class via either Paris or Lille. By overnight train, Paris to Perpignan or Narbonne starts at £18 one-way, £36 return in a reclining seat, £26.50 one-way or £53 return in a 6-berth 2nd class couchette, or £45.50 one-way or £91 return in a 1st class 4-berth couchette. Like air fares, prices rise as cheaper tickets are sold. You can book sole or dual occupancy of a 4-berth compartment, this is called Espace Privatif, see details of costs & how to arrange this here. Click here for details of how to buy train tickets to France. When using www.loco2.com, remember to click 'add via/stopover' and enter 'Lille Europe' if you only want to see journeys via Lille. This option is usually faster, more frequent and in many cases cheaper than going via Lille, if you don't mind changing stations in Paris by metro or taxi. Indeed, if you allow an extra hour or two, you can have a meal at the amazing Train Bleu restaurant inside the historic Gare de Lyon, making a virtue out of necessity! You'll see the same great scenery along the rural Rhone Valley then across the South of France as taking the Lille route. I won't list all the possible options here, to find train times and prices via Paris, simply run an enquiry at www.loco2.com. Use the More options link and enter Paris as a via station with a suitable duration to add in a stopover for lunch or a longer stop. For help crossing Paris by metro or taxi, see the Paris metro page. Travel from London to Paris by Eurostar, leaving London St Pancras at 16:31 daily, arriving Paris Gare du Nord at 19:47. Cross Paris by metro or taxi to the Gare d'Austerlitz. Travel from Paris to Carcassone or Perpignan by intercité de nuit overnight train, running daily in summer (July to September) and Friday & Sunday nights in winter. It leaves Paris Gare d'Austerlitz at 22:08 and arrives Carcassone at 07:35, Perpignan at 08:49, Port Vendres 09:24, Cerebère at 09:38. This train has 4-berth 1st class couchettes and 2nd class 6-berth couchettes, see the photos & information here. Times may vary, so always check times online for your date of travel. By all means book an earlier Eurostar if you'd like some time in Paris. Tip: Why not book an earlier Eurostar & have dinner at the famous Train Bleu restaurant at the Gare de Lyon before strolling across the Seine (5 min walk) to the neighbouring Gare d'Austerlitz to board your sleeper south? Travel from Perpignan or Carcassone to Paris by intercité de nuit overnight train, running daily in summer (July to September) and Friday & Sunday nights in winter. It leaves Cerebère at 19:10, Port Vendres at 19:25, Perpignan at 20:00 or Carcassone at 21:07, arriving Paris Gare d'Austerlitz at 06:52. Cross Paris by metro or taxi to the Gare du Nord. This train has 4-berth 1st class couchettes and 2nd class 6-berth couchettes, see the photos & information here. Times can vary, so always check times for your specific date of travel. Travel from Paris to London by Eurostar, leaving Paris Gare du Nord at 09:13 and arriving London St Pancras at 10:39. London to Paris starts at £44 one-way or £58 return in 2nd class, £112 one-way or £168 return in 1st class with meal & wine included. Paris to Carcassone, Perpignan or Portbou starts at £26.50 one-way or £53 return in a 6-berth 2nd class couchette, or £45.50 one-way or £91 return in a 1st class 4-berth couchette. Like air fares, prices rise as cheaper tickets are sold. Reclining seats start at £18 one-way, £36 return, but I strongly recommend booking a couchette in a safely-locked compartment so you can sleep, a seat is a false economy. Use www.loco2.com. Click here tfor full details on how to buy train tickets to France. You can book sole or dual occupancy of a 4-berth compartment, this facility is called Espace Privatif, see details of the cost & how to buy tickets here. Espace Privatif can be booked online at www.trainline.eu & www.oui.sncf, but not at other websites selling French train tickets. There are two options, both benefitting from the opening of the extension of the Paris-Tours high-speed line all the way to Bordeaux on 2 July 2017. This knocked another hour off the journey. Option 1, via Paris. This is the most frequent and usually cheapest option, although it means changing trains and stations in Paris. You travel by Eurostar to Paris Gare du Nord, change trains and stations, then take a TGV high-speed train from Paris Gare Montparnasse to Biarritz or Lourdes. Times via Paris are shown below, but this route has some seasonal variations so check times for your specific date online at www.loco2.com. Why not take an earlier Eurostar and have lunch in Paris? Option 2, changing Lille & Bordeaux, which avoids Paris... You can take Eurostar to Lille and travel by direct TGV from Lille to Bordeaux, with (usually) another change there. This avoids the need to change trains and stations in Paris, but it usually works out more expensive. I haven't shown this option here, but you can easily check train times at www.loco2.com - it may help to click More options and specify Lille (any station) in the via box. * = The 05:40 Eurostar from London doesn't usually run in July & August. e = the Eurostar connection runs an hour later on Saturdays. f = the first Eurostar connection runs an hour later on Sunday mornings. By all means choose an earlier evening Eurostar outward or a later morning one inwards. Please check train times for your date of travel using www.loco2.com or www.trainline.eu, as times vary on different dates. How to buy tickets What is Eurostar like? What are TGVs like? There are combined Eurostar+TGV fares from London to Biarritz or Lourdes, starting at £68 one-way or £120 return 2nd class, £134 one-way or £238 return 1st class via either Paris or Lille. Alternatively, you can buy separate Eurostar & TGV tickets. London to Paris by Eurostar starts at £44 one-way, £58 return. Paris to Lourdes, Biarritz, St Jean de Luz, Hendaye or Irun starts at just €25 each way. The interior is styled by designer Christian Lacroix, and there are power sockets at all seats. 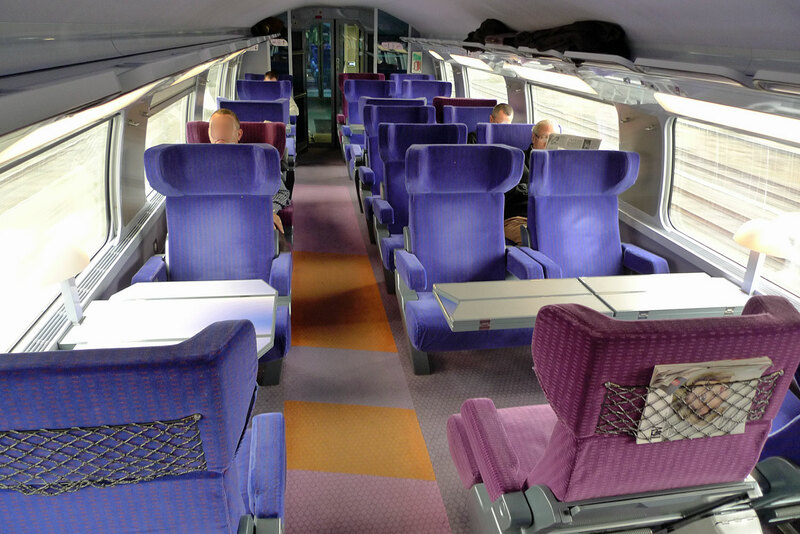 On the TGV Atlantique route from Paris to Bordeaux & the Spanish border, one 1st class car has a conventional open plan layout, the other two have a unique layout with bays of two seats facing across a table one side of the aisle, and semi-compartments of 4 seats around a table on the other, as pictured below. Very civilised! 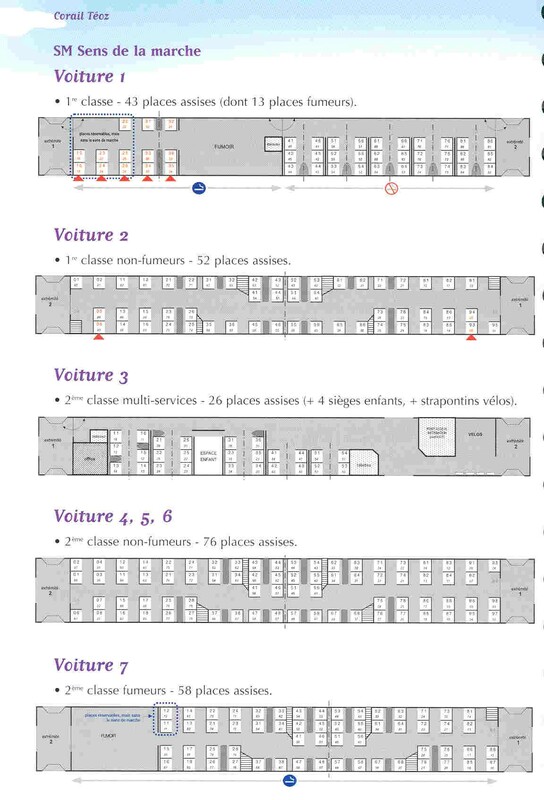 Note that an increasing number of trains on this route are new TGV Duplex double-decker trains, some with the all-new Océane interior. 2nd class on the TGV. Most seats are unidirectional, there are some tables for 4. See panorama photo. 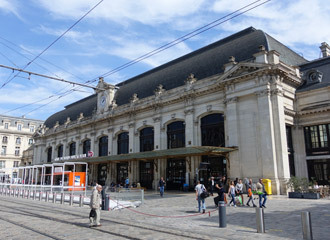 The easiest and most painless way to travel from London to Lyon is to take Eurostar from London St Pancras to Lille and make a simple same-station interchange in Lille onto a direct TGV to Lyon, with no need to change trains and stations in Paris. Relax over a glass or two as you swish past the French countryside, the green hills just north of Lyon are especially pretty. It's almost as fast as flying, but far more enjoyable with no airport security queues in sight. Services with one easy change at Lille are shown in the timetables below. Map of Lyon showing station. Alternatively, you can take Eurostar from London St Pancras to Paris Gare du Nord, change trains and stations in Paris, and take a TGV from Paris Gare de Lyon to Lyon. Although not as simple as the route via Lille, going via Paris offers an almost hourly departure from London, and cheap fares seem more plentiful this way. You can also (of course) stop off in Paris. Train times via Paris are not shown below, but there are hourly Eurostars from London to Paris Gare du Nord (journey 2 hours 40 minutes) and hourly TGVs from Paris Gare de Lyon to Lyon (journey 2 hours). Almost all Paris-Lyon TGVs and a few Lille-Lyon services are now impressive double-deck TGV Duplex. If you want to go via Paris, just check times using either www.loco2.com or www.trainline.eu. Direct London-Lyon Eurostar: Eurostar now offer an early-morning direct train from London to Lyon running between 1 and 5 days a week for much of the year, see the Direct Eurostar to Lyon, Avignon & Marseille page for details. * On Mondays May-September the Eurostar leaves London 07:19 arriving Lille at 09:51 (this is in fact the direct Eurostar to Lyon). Still leaves 06:47 on Tue-Fri.
How to read these timetables: It's easy, you read downwards, each column is a journey you can take. You change trains at each grey bar. Please check train times for your date of travel using www.loco2.com as times vary significantly by date. There are combined Eurostar+TGV fares from London to Lyon or Grenoble, starting at £62 one-way or £110 return 2nd class, £129 one-way or £228 return 1st class via either Paris or Lille. Children under 4 go free. Children 4 but under 12 £59 one-way, £104 return. Youth fares (aged 12-25) start at £60 one-way, £106 return. Alternatively, you can buy separate Eurostar & TGV tickets. London to Paris by Eurostar starts at £45 one-way, £58 return. Paris to Lyon or Grenoble starts at just €20 each way. Option 1, via Lille, easiest... The easiest and most painless way to travel from London to Bordeaux is to take Eurostar to Lille Europe in 1h30 and make an easy interchange in Lille onto a direct double-decker TGV Duplex to Bordeaux now taking as little as 4h26 with no need to change trains and stations in Paris (although you may need to walk 500m between Lille Europe and Lille Flandres stations). Relax over a glass or two as you swish past the French countryside. However, although this avoids the need to change trains and stations in Paris, there are only a few options each day, as shown below, and most involve a short 500m 6-minute walk between Lille Europe and Lille Flandres stations, as shown by the little 'f'. You can easily check times and buy tickets at www.loco2.com - Tip: Click More options and enter Lille (any station). If necessary, book London-Lille first, add to basket, then add Lille to Bordeaux..
Option 2, via Paris, most frequent & quickest, London to Bordeaux in as little as 5h45... There are hourly Eurostars to Paris Gare du Nord in 2h20, take the metro or a taxi to Paris Gare Montparnasse and hop on a TGV to Bordeaux St Jean taking as little as 2h04 since the new Tours-Bordeaux high-speed line opened in July 2017. The train times via Paris aren't shown here, but you can easily check times and buy tickets at www.loco2.com or www.trainline.eu. Some of these TGVs are single deck, others are double-deck TGV Duplex. * = On Mondays & Fridays the Eurostar leaves London earlier, at 06:13 or you can use the 07:19 when running. f = This train arrives/departs Lille Flandres station, not Lille Europe, an easy 500m 6-minute walk from Lille Europe Eurostar/TGV station. Always check train times for your date of travel at www.loco2.com or www.trainline.eu (anyone), as times vary on certain dates. Only journeys via Lille are shown here. There are many other journey opportunities changing trains and stations in Paris, check times and prices at www.loco2.com or www.trainline.eu. There are combined Eurostar+TGV fares from London to Bordeaux or Angoulême, starting at £62 one-way or £110 return 2nd class, £129 one-way or £228 return 1st class via either Paris or Lille. Children under 4 go free. Children 4 but under 12 £59 one-way, £106 return. Youth fares (aged 12-25) start at £60 one-way, £106 return. Combined Eurostar+TGV fares from London to Tours, St Pierre des Corps or Poitiers, start at £49 one-way or £89 return 2nd class, £118 one-way or £209 return 1st class. Alternatively, you can buy separate Eurostar & TGV tickets. London to Paris by Eurostar starts at £45 one-way, £58 return. Paris to Bordeaux starts at just €20 each way, Paris to Poitiers from €15 each way. Tip: Using www.loco2.com, click More options and enter Lille (any station). If necessary, book London-Lille first, add to basket, then add Lille to Bordeaux.. 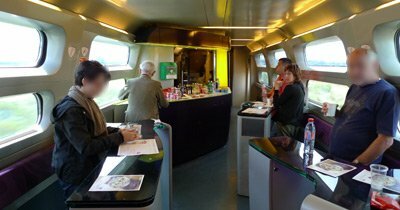 Most Lille-Bordeaux are double-deck TGV Duplex, see the photos here. 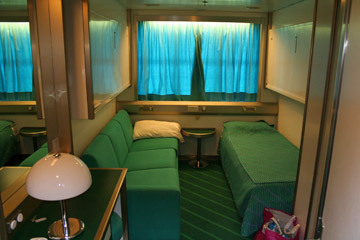 Some Paris-Bordeaux TGVs are single-deck with the Christian Lacroix interior, see the photos here. 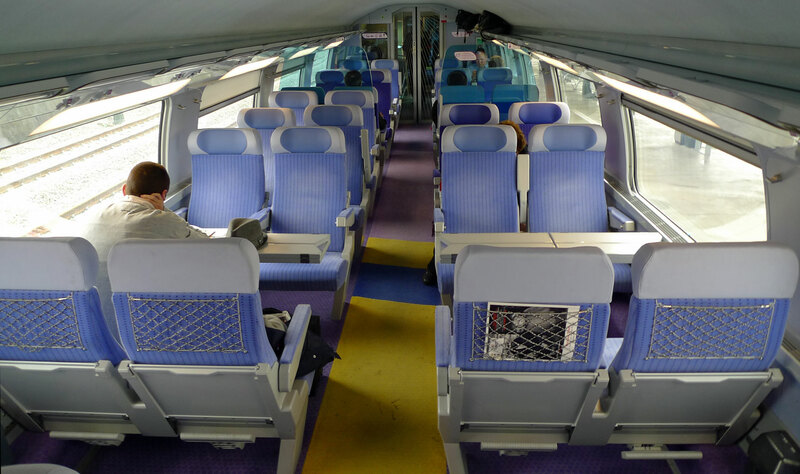 Others are TGV Duplex, and some of these have the excellent new Océane interior. Hello Bordeaux! A 186 mph TGV Duplex double decker has arrived in Bordeaux from Lille. Bordeaux St Jean is a beautiful station, superbly renovated. Note the map of the French rail network on the far wall! Option 1, via Lille, the fastest & easiest way... There are two or three departures every day with one same-station change at Lille. I have shown times for these easy options below. It can take as little as 5h03 centre to centre, virtually as fast as flying. Train times for both routes are shown here, you can check train times for specific dates and buy tickets at www.loco2.com. Option 2, via Paris, the most frequent way... You can travel by Eurostar from London St Pancras to Paris Gare du Nord in 2h20 with departures almost every hour, it's just an easy 10-minute walk over to the Gare de l'Est next door, then you take one of the frequent high-speed TGVs from Paris to Strasbourg taking as little as 1h47 now that the final section of high-speed line opened on 3 July 2016. This is the most frequent route and with the widest choice of departures. I have not bothered to show times via Paris here as there are so many departures and it's easy just to run an enquiry to see times, prices & buy tickets at www.loco2.com. Check train times for your date of travel using www.loco2.com or www.trainline.eu as times vary on certain dates. * = On some dates, depart Lille 19:35, arrive London 20:05. There are combined Eurostar+TGV fares from London to Strasbourg or Nancy, starting at £57 one-way or £100 return 2nd class, £123 one-way or £218 return 1st class via either Paris or Lille. Children under 4 go free. Children 4 but under 12 £55 one-way, £97 return. Youth fares (aged 12-25) start at £54 one-way, £96 return. Alternatively, you can buy separate Eurostar & TGV tickets. London to Paris by Eurostar starts at £45 one-way, £58 return. Paris to Strasbourg starts at just €20 each way. 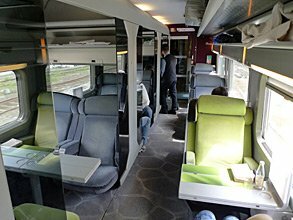 There are two rail routes from Paris to Toulouse: The classic direct route from Paris Gare d'Austerlitz to Toulouse via Limoges & Brive uses conventional 125mph trains, most now stylish and comfortable Téoz carriages, see the photos below. The high-speed route from Paris Gare Montparnasse to Toulouse via Bordeaux uses 186mph TGVs, this is a longer way round but it's still faster, especially since 2 July 2017 when the Tours-Bordeaux high-speed line opens. How to buy tickets What is Eurostar like? What are TGVs like? What are French overnight trains like? 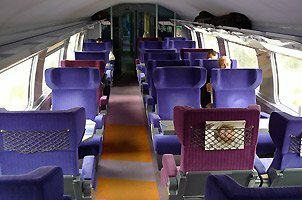 * By Intercités de Nuit couchette train between Paris & Toulouse, with 2nd class 6-berth couchettes, 1st class 4-berth couchettes, reclining seats. Watch the Intercités de Nuit video. Times may vary. ** Runs an hour later on Sunday mornings and doesn't go beyond Brive. Check alternatives online. e = Eurostar connection varies on certain dates or days of the week. Trains marked TGV are 186mph TGV trains. Trains running via Limoges are 125mph Intercité (formerly Téoz) trains, see photos below. Please check train times for your date of travel using www.loco2.com or www.trainline.eu, as times may vary on certain dates. There are combined Eurostar+TGV fares from London to Toulouse, starting at £68 one-way or £120 return 2nd class, £134 one-way or £238 return 1st class via either Paris or Lille. Combined Eurostar+TGV fares from London to Limoges start at £57 one-way, £100 return 2nd class, £123 one-way, £218 return 1st class. Children under 4 free. Children under 12 £55 one-way, £97 return. Youths (aged 12-25) from £54 one-way, £96 return. Alternatively, you can buy separate Eurostar & TGV tickets. London to Paris by Eurostar starts at £45 one-way, £58 return. Paris to Limoges starts at €20 each way, Paris to Toulouse starts at just €25 each way. Tip: If you want the classic route via Limoges, it helps to click More options and add Limoges as a via station. 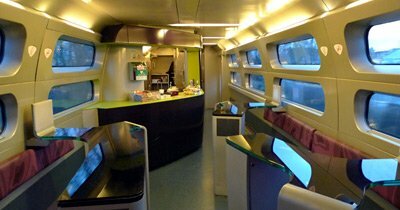 Intercités, formerly Téoz: Although merely 125mph trains, not TGVs, most Paris-Limoges-Brive-Toulouse trains now use stylish air-conditioned Téoz coaches like this, with a unique interior design. 1st class seats have power-recline and are fitted with power-points for laptops/mobiles. There's a small children's play area in 2nd class, & baby-changing room. There is usually a cafe-bar or at least a refreshment trolley service. Watch the video. Seating plan. Just hop on a Eurostar from London St Pancras to Paris Gare du Nord, change stations by taxi or metro to the Gare de Bercy, and catch a southbound express to the Massif Central... 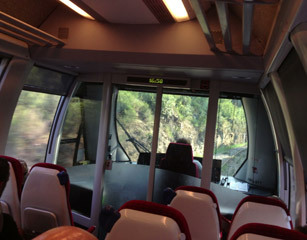 Trains between Paris and Clermont are usually Intercités with the Téoz-style interior, see the photos above. Eurostar times may vary at weekends, so please check times online for your specific date. Eurostar offer combined Eurostar+TGV fares from London to Clermont Ferrand starting at £57 one-way or £100 return 2nd class, £123 one-way or £218 return 1st class. Like air fares, fares increase as the cheaper seats are sold, so book early & shop around for the cheapest departure. Check the online booking system to see prices for your date of travel. Children under 4 go free. Children 4 but under 12 £55 one-way, £97 return. Youth fares (aged 12-25) start at £55 one-way, £97 return. Alternatively, you can buy separate Eurostar & TGV tickets. London to Paris by Eurostar starts at £45 one-way, £58 return. Paris to Vichy or Clermont starts at €20 each way. The best way to reach Brittany by train is to take a Eurostar to Lille and make one easy change of train in Lille onto a direct TGV to Brittany. This avoids the need to change trains and stations in Paris. There are a couple of good services daily, as shown below. Check times for your specific dates at www.loco2.com or www.trainline.eu. You can also travel by Eurostar to Paris Gare du Nord, change trains and stations in Paris, then take a TGV from Paris Gare Montparnasse to Le Mans, Angers, Nantes, and Rennes. This is less convenient, but there are a wider choice of departures and sometimes cheaper fares. I haven't shown times for this route here, but you can easily check times & prices via Paris at www.loco2.com or www.trainline.eu. How to read these timetables... Each column is a service you can take. You read downwards, changing trains where you come to the grey bar. * = runs Monday-Thursday. Does not run on Fridays. ** = On Mondays the Eurostar connection leaves London 07:19 arriving Lille at 09:51. It still leaves at 06:50 on Tuesdays-Fridays. f = departs from Lille Flandres station, an easy 500m 6-minute walk from Lille Europe Eurostar/TGV station. There are combined Eurostar+TGV fares from London to Nantes, Rennes, Quimper, Brest or Lorient, starting at £62 one-way or £110 return 2nd class, £129 one-way or £228 return 1st class via either Paris or Lille. Combined Eurostar+TGV fares from London to Le Mans start at £51 one-way or £90 return 2nd class, £117 one-way or £208 return 1st class. Alternatively, you can buy separate Eurostar & TGV tickets. London to Paris by Eurostar starts at £45 one-way, £58 return. Paris to Nantes or Rennes starts at just €20 each way. There are two ways to reach Normandy, for example St Malo, Caen, St Lo, Arramanches, Cherbourg. You can travel by Eurostar and connecting trains via Paris, or you cross the Channel by ferry with Brittany Ferries. Caen makes a good base for visiting the D-Day beaches, although you can't get to the beaches by train, you'll need to use buses or a hire car. 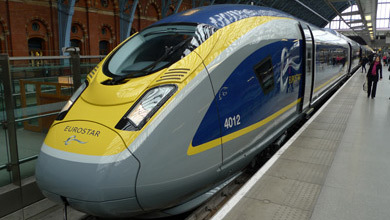 Travelling by Eurostar and connecting trains will take about 6-7 hours and involves a change of trains and stations in Paris. Fares start at £99 return 2nd class (£109 return to Cherbourg), £219 return 1st class (£229 to Cherbourg), booked in advance. Check fares and book online at www.loco2.com or www.trainline.eu. 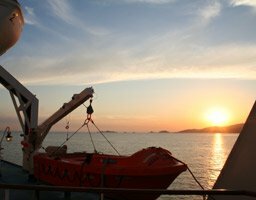 To go by ferry, you take a train from London (Waterloo) or your local station to Poole, Southampton or Portsmouth, then a taxi from the station to the port, then you cross the English Channel by ferry to Normandy. First, check out the ferry routes, times and prices, using the Seat61 Ferry Shop or www.brittany-ferries.co.uk. Routes include Portsmouth-St Malo, Portsmouth-Caen (Ouistreham) & Poole-Cherbourg. 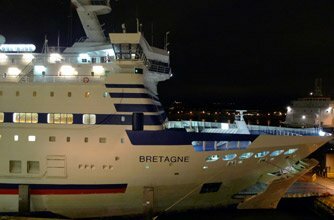 Many of the ferries run overnight with comfortable cabins, allowing you to spend a full day at work on one day, sail overnight and arrive in Normandy for breakfast next morning. Then check UK train times and fares from your local station to Portsmouth, Southampton or Poole using www.nationalrail.co.uk. Remember to allow plenty of time to connect between train and ferry, at least 60-90 minutes, preferably more, plus the ferry check-in time, usually 30-60 minutes depending on the ferry operator. If taking a ferry from Portsmouth Continental Ferry Port, remember the station you want is Portsmouth & Southsea, not Portsmouth Harbour, taking a taxi to the ferry terminal. If arriving at Ouistreham (the ferry terminal for Caen), there's a special bus from the ferry terminal to Caen station in central Caen which leaves after the ferry arrives and passengers disembark - it costs just a euro or two. In the return direction there's no special bus, but the last regular town bus usually leaves Caen station around 20:00 for Ouistreham town, where you can have a meal then walk to the ferry. Bayeux makes a good base, as many of the tours depart from there, and it's easily reached by train from either Cherbourg, Paris or Caen (and don't forget to visit the Bayeux tapestry, showing a much earlier battle from 1066!). www.viator.com has a selection of tours, including ones starting in Bayeux. Mont St Michel has no station, so you must either take a train to Pontorson-Mont St Michel station which is about 5 miles away (bus and taxi available) or take a train to Rennes and a connecting French Railways bus from there. If you enter 'Mont St Michel' as your destination into www.loco2.com or www.trainline.eu it will offer you both 'Pontorson-Mont St Michel' and 'Mont St Michel'. If you select the latter, it will offer combined train+bus times and fares direct to Mont St Michel via Rennes. Tip: When selecting your seating options on www.trainline.eu, don't panic when it says 'no places available' against the bus (or in French 'car'). That just means there are no allocated seats, you can sit where you like. It does not mean the bus is full! Regular Eurostars link London St Pancras with Lille Europe station, an easy 800m walk from Lille city centre. A handful of Eurostars link London with Calais Fréthun, which is 9 km (5 miles) outside Calais town. Go to www.eurostar.com to check times & fares from London to Lille Europe or Calais Fréthun and to book online. In Calais, taxis are available between Calais Fréthun and Calais town centre, journey time 15-20 minutes, the cost likely to be around €30. Alternatively, there's a regional (= TER) train service between Calais Fréthun & Calais Ville station which costs around €2, you can check train times using www.loco2.com and simply buy a ticket at the station in Calais. You can also travel from London to Calais is by train & ferry via Dover, see the London to Paris by train and ferry page for full details. You can travel from London to Calais one-way for £38.90 using a Calais Day Tripper Ticket, even bought on the day at Charing Cross station, no reservation necessary. This is significantly cheaper than Eurostar if you have to travel at short notice. Go to the German Railways all-Europe online timetable, www.bahn.de/en. This system is excellent at identifying journey opportunities, even ones which involve several changes of train. You can rely on the Germans! Find a journey option that looks convenient for you, and make a note of the trains. Some suggested journeys will have a change of train in Lille (often involving an easy 500m walk between Lille Europe station where the Eurostar arrives and Lille Flandres station), some a change at Calais-Fréthun and occasionally even a change in Paris (via Paris is admittedly a long way round, but it can sometimes be a better bet). The fastest and cheapest option is usually to take a Eurostar from London to Calais-Fréthun and change there onto a TER local train to Boulogne, Etaples, Le Touquet and so on, but it's not the most frequent option as only a handful of Eurostars stop at Calais-Fréthun so you may have to seek these departures out amongst the search results (or put 'Calais-Fréthun' in the 'via' box). Rather than stabbing in the dark using a journey planner, you can easily see the whole train service between London & Calais-Fréthun at a glance if you download the PDF-format Eurostar timetable linked from the Eurostar page. Changing trains at Calais-Fréthun is easy, the Eurostar arrives at platform 4 (platforms 3 & 4 are the two high-level high-speed platforms) and regional TER trains leave from platforms 1 & 2 which are the two low-level classic line platforms, lifts are available. Going via Lille is more frequent, but means doubling-back and so usually costs a bit more. Now go to at www.loco2.com (in English, tickets printed, collected at the station or sent to any UK address) or www.trainline.eu (for any user, tickets printed or collected at the station), and first book the Eurostar from London to Calais Fréthun or Lille & back. Add this to your basket. Still at www.loco2.com or www.trainline.eu, now book the regional train from Calais Fréthun or Lille to your final destination and back, add to your basket and check out. Regional TER train tickets can be used on any train that day, not just the specific one you book. Eurostar & TGV tickets come with a seat reservation and can only be used on that specific train. Alternatively, you can travel from London to Calais, Boulogne, Etaples or Amiens by ordinary domestic train to Dover and ferry to Calais, see the London to Paris by train and ferry page for details. Light blue lines = bus or taxi transfers from rail stations. A direct daytime Eurostar runs from London to the French Alps every Saturday from late December to early April. It leaves London & Ashford in the morning and arrives early evening at Moutiers, Aime & Bourg St Maurice in the French Alps, see the map opposite for the resorts it serves. This is the easiest and most civilised way to reach the Alps from London during the skiing season, and its available both to independent travellers and as part of many skiing holidays. There's also an overnight Eurostar on Friday nights, although without any sleeping berths! See the Ski by Train page for details. Alternatively, you can take regular, scheduled trains running daily, year-round to destinations all over the French Alps. You can travel by day, taking Eurostar to Paris, crossing Paris by Metro, then a high-speed TGV to the Alps, or overnight, taking Eurostar to Paris, crossing Paris by Metro, then taking an overnight train with couchettes. You'll find additional direct Paris-Bourg st Maurice trains on Fridays & Saturdays in the skiing season. 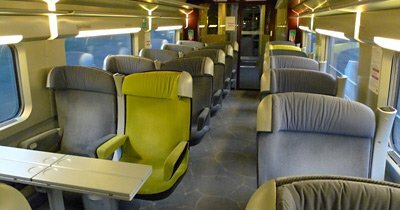 Unfortunately, the overnight couchette trains between Paris & Bourg St Maurice & St Gervais were discontinued from 1 October 2016. How to read these timetables Each column is a service you can take. You read downwards, changing trains where you come to the grey bar. Important: Trains to the Alps vary enormously by date & time of year, in fact I'd call SNCF's timetable on these routes a shambles, so use these times as a rough guide, and check for your own date of travel using www.loco2.com or www.trainline.eu. b = change at Bellegarde. c = change at Bellegarde & St Gervais. d = change at St Gervais. e = Eurostar leaves London at 09:31 on most Saturdays. g = change at Chambéry. Les Arcs is linked to Bourg St Maurice station by a funicular railway which runs every 20 minutes. Leave London St Pancras by Eurostar at 10:58, make one easy change of train at Lille and arrive Marseille St Charles at 19:51. See the train times above for details. London-Marseille starts at £68 one-way or £120 return, book the trains as shown above. On arrival at Marseille St Charles station, either take a taxi to the Corsica Linea (formerly SNCM) ferry terminal, or use the Marseille Metro (www.rtm.fr) from St Charles station 2 stops to Place de la Joliette, you want line 2, direction Bougainville, and the fare is around €1.80. Place de Joliette metro station is just 50m from the entrance to the ferry terminal. You can walk from the station to the ferry terminal via Marseille's famous Vieux Port, but it's a fair old way and not an attractive or easy walk once past the Vieux Port. Sail overnight from Marseille to Ajaccio or Bastia, Corsica's first and second cities respectively. 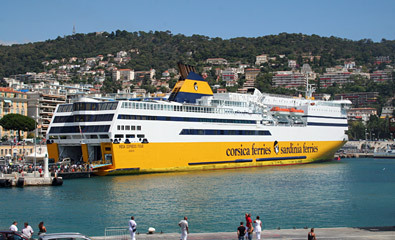 Corsica Linea (www.corsicalinea.com, successor to defunct state-owned SNCM) sails overnight daily to both cities. Sailing times vary, but the ship usually sails from Marseille at around 19:00-21:00 arriving Bastia or Ajaccio around 07:00-08:00. Cabins have en suite toilet & shower, and even satellite TV if you don't mind watching Midsomer Murders in French! The best way to book the ferry is online at www.corsicalinea.com, you simply print out your own ticket and show it at the port, or you can book most ferry routes & operators to Corsica on the Seat61 online ferry booking page. Alternatively, you can book by phone with their UK agent, Southern Ferries, on 020 7491 4968. In the return direction, there are daily overnight ferries from both Ajaccio & Bastia to Marseille. Allow at least 2 hours next morning to make the connection in Marseille, then choose one of the TGV and Eurostar services from Marseille to London shown above. 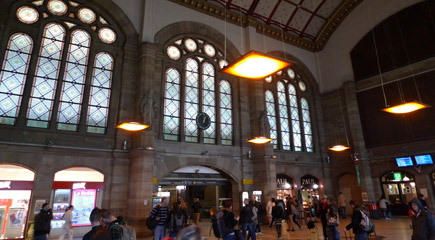 You'll arrive in St Pancras in the early evening, less than 24 hours after leaving Corsica. Step 1, travel from London to Nice by daytime trains and spend a night and morning in Nice. See the train times & fares above, and book the trains online as shown above. Spend the morning exploring Nice. At lunchtime, walk or take a taxi past the Old Town and around the headland to Nice's old port from where the ferries leave. Step 2, Corsica Ferries (www.corsica-ferries.co.uk) have a more or less daily afternoon sailing from Nice to Bastia, and on some days another one to Ajaccio, leaving Nice around 14:00-15:00 and arriving in Bastia or Ajaccio around 19:30-20:30 (all on day 2 from London). Top tip: Even though it's a daytime ferry, spend an extra €30 on a private day cabin, so you can snooze, take a shower and freshen up. Corsica Ferries ships are modern and very comfortable. The easiest way to book the ferry is online at www.corsica-ferries.co.uk, you simply print out your own ticket and show it at the port, or you can book most ferry routes & operators to Corsica on the Seat61 ferry booking page. The price varies depending on the season. In the return direction there's normally a morning sailing from Bastia (and on some days Ajaccio) to Nice, leaving around 08:00. Stay overnight in Nice then travel to London via Paris or via Lille, see the train times & fares above. 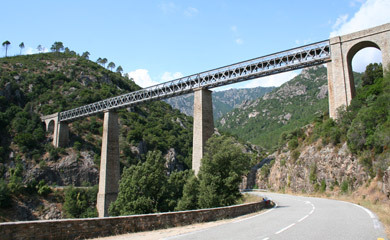 If you'd rather leave all the organisation to someone else, rail travel specialists www.railbookers.co.uk (020 3327 0761) can tailor-make a holiday to Corsica by train and ferry for any length of time, leaving on any date you like, using a variety of train and ferry options. A delightfully scenic narrow-gauge train links Bastia, Ponte Leccia, Corte, Vizzavona & Ajaccio (four trains per day), with a branch from Ponte Leccia to Ile Rousse & Calvi (two trains per day). The line winds right up through Corsica's dramatic central mountains, which explains why the 152km from Ajaccio to Bastia takes 3½ hours! Highly recommended, although it can get hot and crowded in summer. It's run by French Railways (SNCF) though is branded CFC - Chemins de Fer de la Corse. For a route map and timetables, see official site http://cf-corse.fr or unofficial site Chemins de Fer de la Corse. You may find more up-to-date timetables, as well as bus timetables, at independent website www.corsicabus.org. 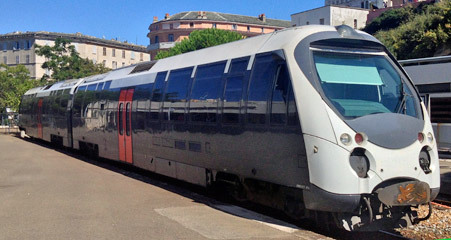 Nw air-conditioned trains with panoramic windows are now in service, linking Bastia & Ajaccio in under 3 hours at up to 100 km/h even on Corsica's narrow metre-gauge tracks. 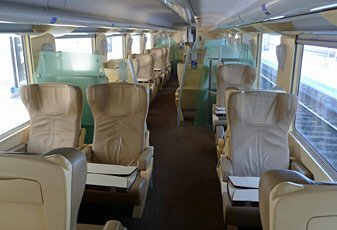 New panoramic trains finally in service on Corsica... Courtesy of Nigel Edmund-Jones. 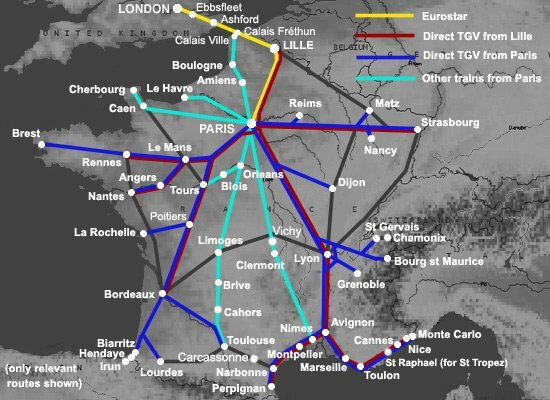 You can get to just about anywhere in France by train from London. Dijon, Reims, Clermont Ferrand, Versailles, Orleans, Blois, and so on. Go to www.loco2.com or www.trainline.eu (residents of any country). You can book from London to your final destination in one go. Look for journeys with an easy-same-station change in Lille if there are any shown. If you are offered this option, it's simpler than crossing Paris. However, for journeys via Paris, it's often better to split the journey in Paris as follows. This is so you can allow longer in Paris for a meal, or if an earlier Eurostar has cheaper fares available, it also allows you to avoid some sub-standard 40-minute cross-Paris connections which have unfortunately been pre-programmed into SNCF's database. I recommend nothing less than 60 minutes for any cross-Paris connection between Paris Nord and Paris Gare de Lyon. Step 1, book from Paris to your final destination at www.trainline.eu. Step 2, allowing at least 60 minutes to cross Paris southbound, 90 minutes northbound (as this includes the 30 minute Eurostar check-in), book from London to Paris and back at www.eurostar.com. 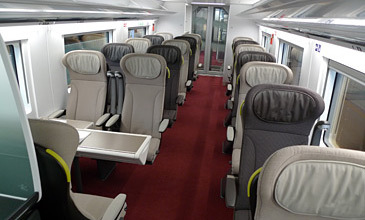 You can choose an exact seat on Eurostar if you book this way too, see tips on choosing a seat here. 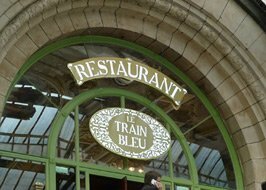 I highly recommend eating at the famous and remarkable Train Bleu restaurant inside the Gare de Lyon, on the main concourse, see the Train Bleu restaurant page for more details. If you'd like a decent meal near the Gare du Nord rather than the Gare de Lyon, try the typically French Brasserie Terminus Nord (www.terminusnord.com), just across the road from the front of the Gare du Nord. It's good quality French cuisine in classic Parisian brasserie surroundings, and so handy for Eurostar. Main dishes cost around €18-€20. 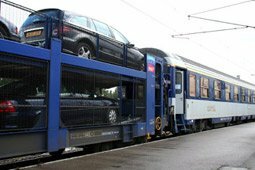 For Motorail car-carrying trains to the south of France, see the motorail page. French Motorail from Calais no longer operates, but a French Railways Auto Train car carrying service operates from Paris to major French cities including Nice and Narbonne. For details see the motorail page. 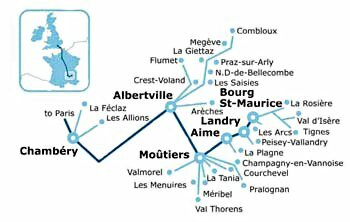 www.greatrail.com - 5-day escorted short breaks to the Champagne region, to the Dordogne, to the Chateaux of the Loire or to Strasbourg & Alsace, all overland by train from the UK, from around £695-£795. Several good companies organise holidays & tours to France by Eurostar & high-speed TGV, with regular departures, no airport hassles and no whole days spent in cramped coach seats on motorways. Rail Discoveries & Great Rail Journeys offer escorted tours where you travel as a group with a tour manager and all the legwork done for you. Railbookers can tailor-make a holiday to key French cities to meet your own requirements, with departure on any date you like. 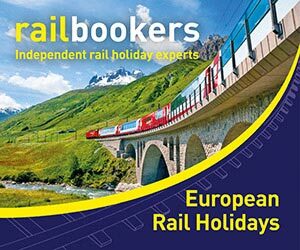 Railbookers can tailor-make a flight-free holiday or short break to France for you, with train travel, transfers & hotels included, leaving on any date you like. For example, they offer a 2-night break to Avignon or a 6-night holiday to Nice & Cannes with daytime train travel by Eurostar & TGV. If you tell them what you want, they'll advise you on the best trains, routes & hotels and sort it all out for you. They get a lot of repeat business! GRJ offers five-star escorted tours to France by train, with 1st class train travel and 5* or 4* hotels. Tours include an 8-day tour to Nice & the Cote d'Azur, the Pyrenees or Lake Annecy & Mont Blanc, all with overland travel from London by train. 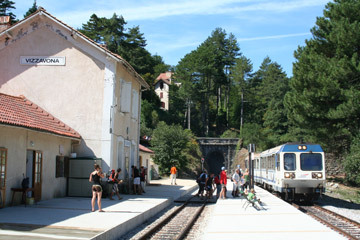 Great Rail Journeys also offer holidays by train to other European countries. Check the tour details & prices online, then call 01904 527120 to book or use their online booking form. Rail Discoveries offers escorted tours to France by train, with 3* or 2* hotels and travel by Eurostar & TGV. For example, they offer a 6-day tour to Annecy & Chamonix in the French Alps, or a 7-day holiday from London to Nice & the French Riviera. Check prices at www.raildiscoveries.com, then book online or call 01904 730 727. City centres and cars don't mix well, so stick with the train for city-based tours. But if you want to get out of the cities and into the countryside, hiring a car can be a great idea. Start by trying Holiday Autos, www.holidayautos.com, they're part of Lastminute.com so are reliable and have a wide range of locations and very good prices. Paying for a guidebook may seem an unnecessary expense, but it's a tiny fraction of what you're spending on your whole trip. You will see so much more, and know so much more about what you're looking at, if you have a decent guidebook. I recommend the Lonely Planet or Rough Guides as the best ones out there for independent travellers. Click the images to buy the books - if you buy anything at Amazon through these links, Seat61.com gets a small commission (at no extra cost to you) to help support the site. My own book, an essential handbook for train travel to Europe based on this website called "The Man in Seat 61", was first published in June 2008 and revised April 2010, and is available from Amazon with shipping worldwide. There's the famous & flashy Paris Ritz in the Place Vendôme of course (over €900 a night) or the similarly-priced Le Meurice, but if you want a really special hotel for a luxury break or romantic weekend and can afford to splurge around €290 a night, I'd recommend the small, sumptuous and intimate L'Hotel. It's on the bohemian left bank, walking distance from the Seine, the Ile de la Cité & Notre Dame. Oscar Wilde spent the last days of his life here in room 16, and the hotel has been used by many famous people from Sinatra to Mick Jagger. Rooms are on the cosy side, but they are beautifully decorated and have character that other hotels lack. www.tripadvisor.com is a good place to browse independent travellers' reviews of the main hotels, and it has the low-down on destination sights & attractions, too. www.accorhotels.com: If you want a consistently good-quality hotel at a reasonable price, rather than unique character, try the Ibis, Mercure & Sofitel hotels run by Accor group in almost all French cities, with online direct booking. A city-centre Ibis hotel booked in advance online can be a very good deal.